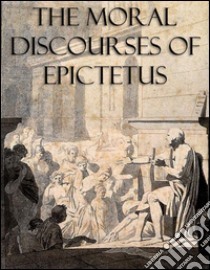 The Moral Discourses of Epictetus. This edition includes the Discourses and Selected Writings, The Enchiridion. Translated by Elizabeth Carter. Epictetus (AD c. 55–135) was a Greek sage and Stoic philosopher. He was born a slave at Hierapolis, Phrygia (Turkey), and lived in Rome until his banishment, when he went to Nicopolis in northwestern Greece for the rest of his life. His teachings were written down and published by his pupil Arrian in his Discourses. Philosophy, Epictetus taught, is a way of life and not just a theoretical discipline. To Epictetus, all external events are determined by fate, and are thus beyond our control; we should accept whatever happens calmly and dispassionately. However, individuals are responsible for their own actions, which they can examine and control through rigorous self-discipline. Both the Discourses (Book 1, 2, 3 and Book 4) and the Enchiridion begin by distinguishing between those things in our power and those things not in our power. That alone is in our power, which is our own work; and in this class are our opinions, impulses, desires, and aversions. What, on the contrary, is not in our power, are our bodies, possessions, glory, and power. Any delusion on this point leads to the greatest errors, misfortunes, and troubles, and to the slavery of the soul. The philosophy of Epictetus plays a key role in the 1998 novel by Tom Wolfe, A Man in Full. This was in part the outcome of discussions Wolfe had with James Stockdale (see above). The importance of Epictetus' Stoicism for Stockdale, its role in A Man in Full, and its significance in Gladiator (2000 film) is discussed by William O. Stephens in The Rebirth of Stoicism? Mohun Biswas, in the novel A House for Mr Biswas (1961), by V.S. Naipaul, is pleased to think himself a follower of Epictetus and Marcus Aurelius; the irony is that he never actually behaves as a Stoic. “Everything has two handles, the one by which it may be carried, the other by which it cannot” is the theme of Disturbances in the Field (1983), by Lynne Sharon Schwartz. Lydia, the central character, turns often to The Golden Sayings of Epictetus. A line from the Enchiridion is used as a title quotation in The Life and Opinions of Tristram Shandy, Gentleman by Laurence Sterne, which translates to, "Not things, but opinions about things, trouble men." The quotation alludes to a theme of the novel about how the suffering of many of its characters is the result of the opinions and assumptions they make about reality.